So my pie obsession continues. Undocumented on this site is the Apple Crumb Pie with the extra crispy crumbs. I realize now it’s time to take my oven thermometer out of the plastic shell and put it to use. My top oven seems to be baking a bit higher than said degrees. So Thanksgiving was right around the corner and I decided this would be the perfect time to expand my pie repertoire. The tv in my family room/kitchen area serves as the DVR source for all my favorite cooking and craft shows and at the top of my list is The Martha Stewart Show. I scrolled through my show list and saw that Martha was having Rachael Ray on to teach her (a self proclaimed non-baker) how to bake a pie. 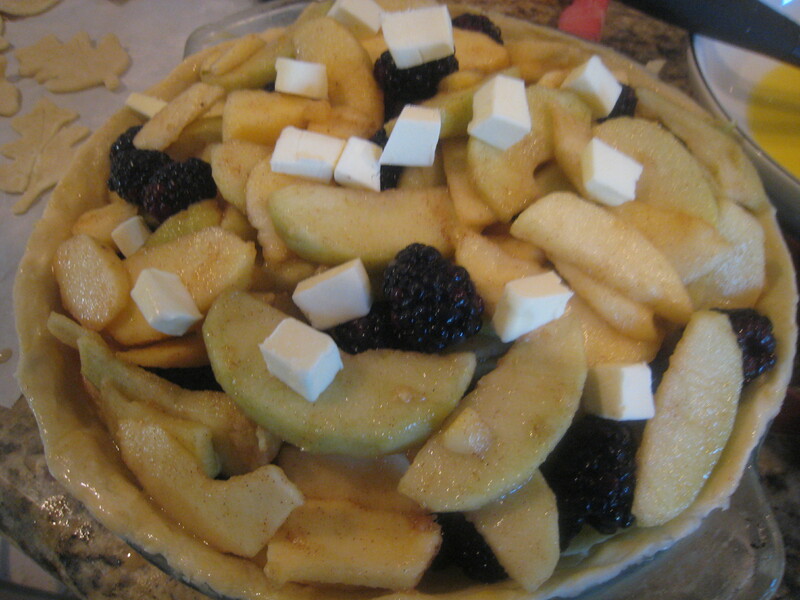 The pie is Martha’s Apple Blackberry Pie with Fall Leaves . I watched the show through (even the not so interesting craft segment at the end) and went to the show’s website to put together my shopping list of ingredients. My store had the Jonagold and Granny Smith. 3 of each made the 2 1/2 pounds. Thanksgiving morning I gathered all of my ingredients, tools and food processor while the turkey cooked and queued up the DVR. With Martha ready to roll sat down at the table for a bit and peeled my apples while watching her extol the virtues of never over mixing pie crust and “Make it cold, bake it hot. ” . The setting and mood were just perfect. 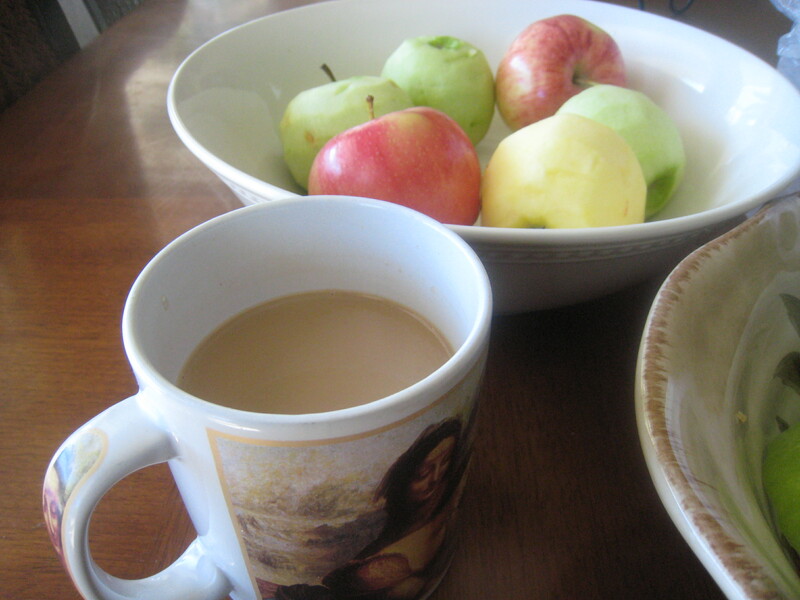 Thanksgiving morning, cool morning in the desert a richly brewed cup of my favorite “Starbucks Breakfast Blend” and just the right angle of sunlight to make my apples look like they had been sent from heaven. With apples peeled it was time to move on to lesser known and intimidating turf. The crust. What I didn’t take the time to do was thoroughly read through the recipe to realize how long the pie crust would need to be refrigerated and rest before it became home to my apples and blackberries. Had I done this, I wouldn’t have peeled my apples for at least another two hours but…had I not done this I would have missed the perfectly angled sunlight hence no heavenly apples. So…it happened this way for a reason and no apples were harmed in the process. So with remote in hand I followed Martha’s directions ~ watch here . I watched, rewound, watched, rewound. Family entered room asked questions, lost my train of thought. Rewound again.I pulsed my food processor and added water along the outside of the bowl just as Martha told Rachael/me to do. 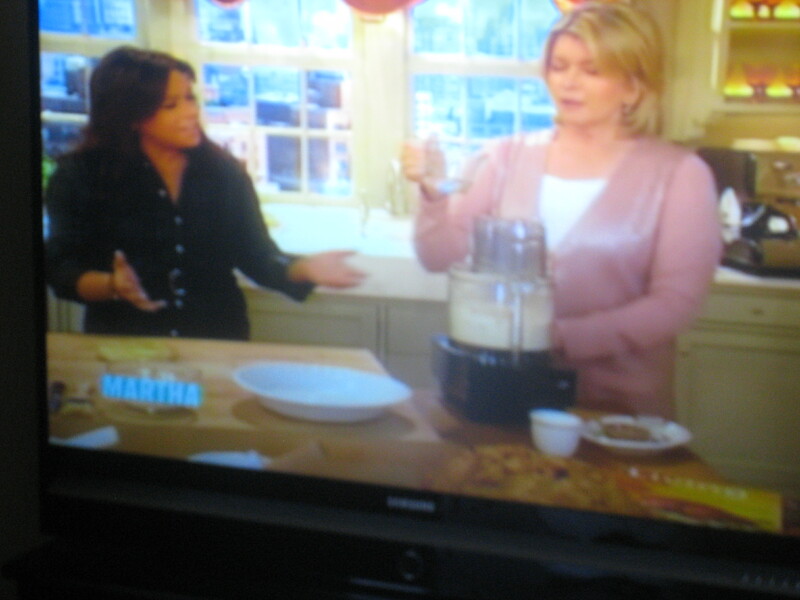 Thank you Martha for going to the basics in this episode and getting into the nitty gritty of Pie 101. Without watching this I surely would have over processed and taken it to the stage of becoming a dough ball coming out of the food processor. Incorrect. It needs to be crumbly and the brought together by hand on a floured surface which is just what I did. I made my dough recipe here (actually called “Fall Leaves Pate Brisee”), divided it in two and formed them into flattened disks (to make them easier to roll out when it was time to). 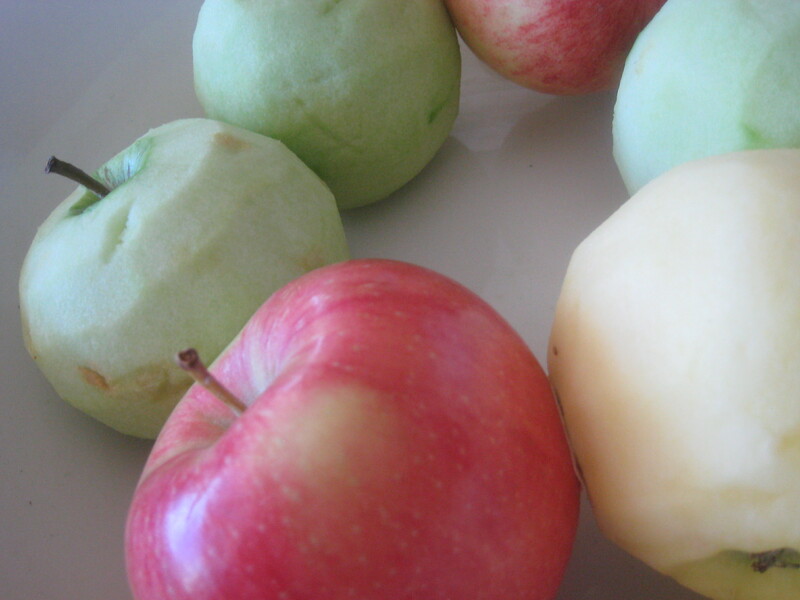 I refrigerated them as Martha told me to and got back to my apples. Apples peeled, cored and sliced. I mixed together the ingredients for the filling and preheated my oven as Martha said to at 450 (to be turned down to 400 when pie was put in the oven), saying Martha’s pie mantra “Make it cold, bake it hot!”. Dough out of the fridge. Roll out one disk to create bottom crust of the pie. Martha calls the top crust “Fall Leaves Pate Brisee” and recommends getting the perfect leaf cutters from Sugarcraft.com. Without enough time to order them I went with my Wilton pumpkin, leaf and turkey set of cutters bought from the clearance bin at WalMart. I thought the pumpkins and turkeys would be a nice touch. So next I rolled out the second dough disk and cut out a bunch of leaves, pumpkins and a few turkeys that I figured I’d put near the top as the crowning glory. These were placed in the freezer a bit to firm up. Next I added my delectable fruity filling to the bottom crust and dotted in some butter as my tv instructor told me to. With the leaves, pumpkins and turkeys out of the freezer, I covered the mound of fruit a la Martha and it was a beautiful sight! Next I brushed on the egg wash, sprinkled it with sanding sugar and lowered the oven. Martha said to bake it for the first 30 minutes at 400 and then to lower the temp to 350 and continue baking for about an hour and 45 minutes. While my dough had been refrigerating I read the readers’ comments about the recipe on her website and found most cut the baking time closer to an hour or hour and ten minutes after the initial 30. That’s what I did. Took it out after the post 30 hour and let it cool while we all ooed, ahhed and enjoyed the thrill of my newborn pie. Sadly my camera was lost in the chaos and mix of my Thanksgiving kitchen (I found it later behind the can of fried onions) and only had my phone to capture the final beauty of it all so kindly excuse the crummy photo. The top crust was a bit overcooked and next time I will surely have my oven thermometer to get an exact temperature. The pumpkins and turkeys weren’t exactly recognizable but the leaves kept their shape beautifully. Next time just the leaves. The crust was crispy and the filling was a gorgeous jammy blend of wonderful fruit. My family and guests enjoyed it and so did I. Mine was served with a heaping portion of pride on the side. 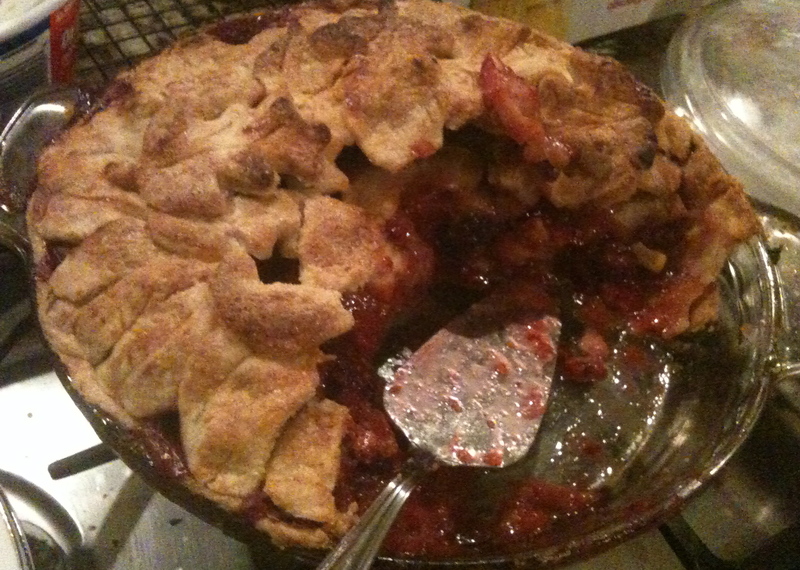 This entry was posted in Pie and tagged baking apples, blackberry, first pie, Martha Stewart, Rachael Ray, Thanksgiving. Bookmark the permalink. Thanks so much Karine! My family keeps asking me to make it again. I posted the links to the recipes but I should have put them in my post to make them easy to get to. I’ll do that here : ). Pulse flour, salt, and sugar in a food processor until combined. 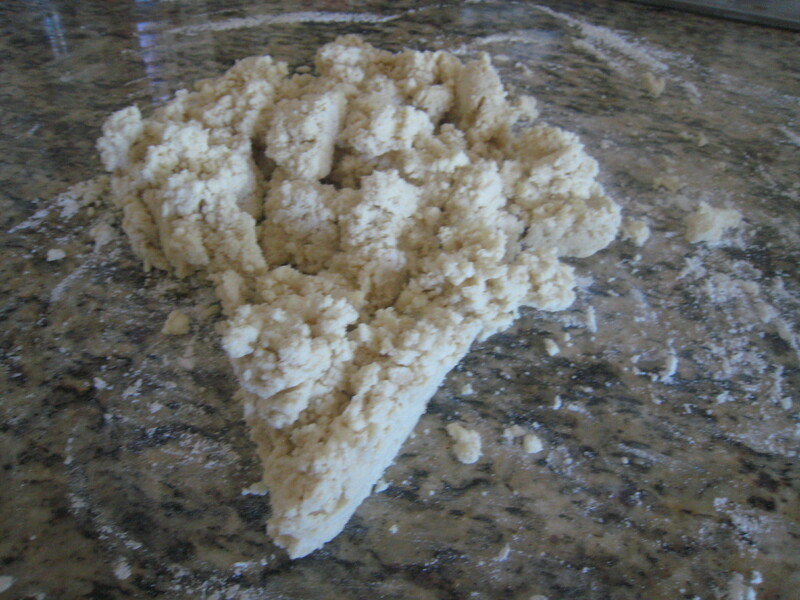 Add butter, and pulse until mixture resembles coarse crumbs with some larger pieces remaining, about 10 seconds. 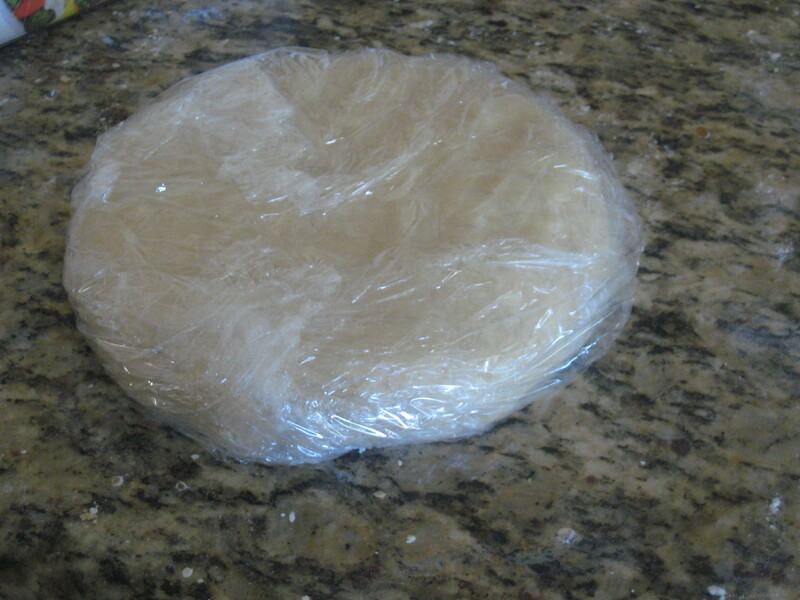 Roll 1 disk of dough to 1/8-inch thickness on a floured surface. Fit dough into a 9-inch pie dish. Trim edge flush with rim. Freeze until firm, about 30 minutes. Roll remaining disk to 1/8-inch thickness on a floured surface. Transfer to a piece of parchment. Cut out 18 leaves, rerolling scraps if needed, using 3 1/2-inch leaf-shaped cutters (sugarcraft.com). Transfer leaves to another piece of parchment; chill if needed. Gently press the dull edge of a paring knife into leaves to create veins. Freeze until firm, about 30 minutes. 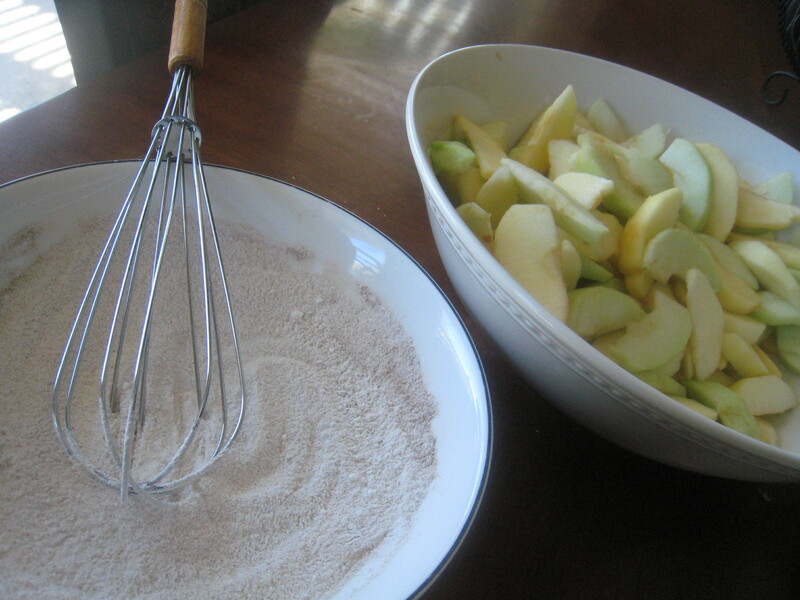 Whisk together granulated sugar, cornstarch, cinnamon, and salt in a large bowl. Add apples and blackberries, and toss to coat. Pour filling into prepared piecrust, and dot with butter. Preheat oven to 400 degrees with rack in lowest position. Meanwhile, brush rim of piecrust with egg wash. 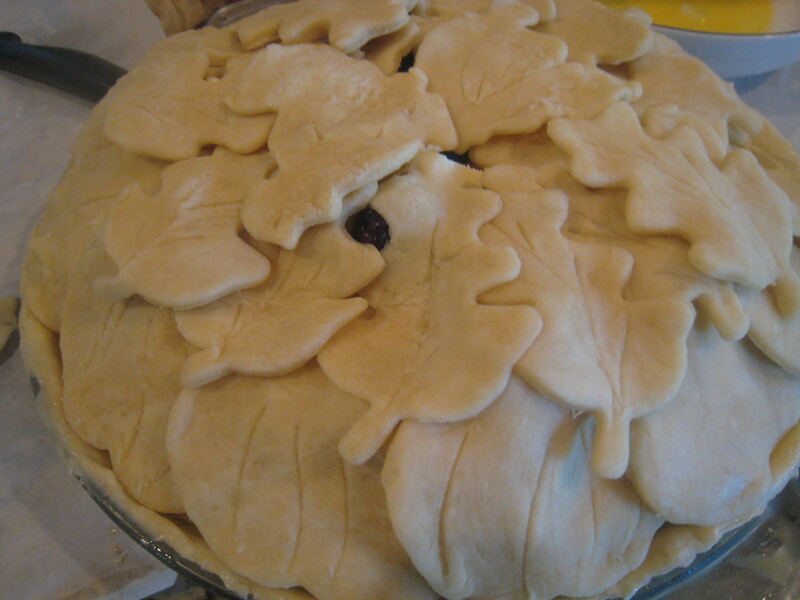 Arrange dough leaves over filling, creating a spiral from the edge into the center, overlapping leaves slightly to cover pie but leaving some openings. Lightly brush tops of leaves with egg wash as you work, to help them adhere. 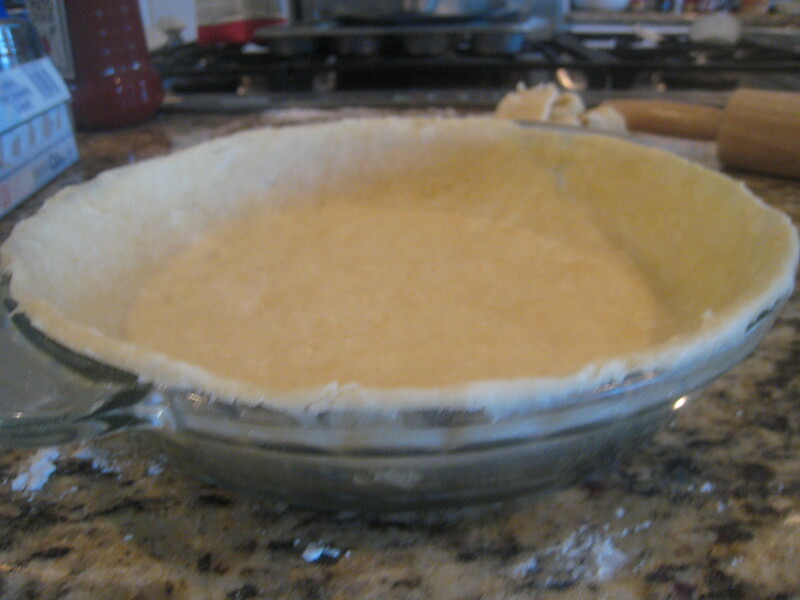 Once filling is covered with leaves, lightly brush top of entire pie with egg wash. Sprinkle with sanding sugar. Freeze for 30 minutes. Your pie is stunning, as is evidenced even by the camera phone photo!! You did a great job. I’m impressed that you were able to stick with martha the whole way through…all the details would have driven me nuts. Really like your blog, and your writing. I’ll be back. Thanks so much, I really enjoyed your blog as well. I had to rewind many times to follow Martha but what was especially nice was that she truly broke the basics into baby steps. I was SO determined to make this pie. It was like jumping into the deep end of the pool without getting my feet very wet. You made my day, week, month! Thanks so much for your thoughtfulness. I’ll swing by and pay you a visit and look forward to sharing more cooking adventures with you : ). woohoo! that’s one yummy looking pie! the crust looks perfect ! Thanks so much!! I getting geared up to try another one! Martha is a stiff prude, but she sure knows how to bake! Thanks burpexcuzme! So nice to meet you, thanks for coming by! That leaf topping is absolutely beautiful. Thanks so much! It was a lot of fun to make! Hello, thank you so much for the lovely things you said on my blog and introducing me to yours! If you like Martha and pies you might be amused by http://www.doughmesstic.com ‘s report of her participation in Martha’s pie contest a month or so back. It’s hilarious. Thanks so much Sarah, it’s so nice to meet you, you have a wonderful blog! Your writing, style and photography are exceptional! I really appreciate your recommendation and will head right on over to pay Doughmesstic a visit. I do too, so fancy pretty (and tasty too)! Man, that pie looks awesome! Thanks so much, you just gave me a huge confidence boost! It was delicious! The pie looks great, and I have to play with pie cut outs like I have seen lately, although my grandmother might not approve, oh maybe she should get with the times! I really enjoyed the cutouts. Making them had that playing with Play Doh feeling that made the kid in me very happy! I want to order the cutters Martha recommended for my next go at it. Thanks for posting, and for the tip on cutting back the time! I was eyeing the recipe for Thursday and a bit nervous about making it, despite having a good number of apple pies under my belt.